...probably forever, as they acknowledge in the text. Ratings for Season Two were even worse than for Season One. I was satisfied with the resolution and the happy endings bequeathed upon all, and that they still allowed some room for a third season. BECAUSE THERE WILL BE A THIRD SEASON. I was a little disappointed that the Enchanted Forest rescue army essentially showed up to march into battle and promptly disappeared. I would have loved watching that fight unfold. Gareth, good guy, really, even if he's a terrible good guy. In a weird backwards way, he's the anti-Galavant setting off with a squire and everything. I was happy with Richard's rehabilitation and the cat handing out at the dock was splendid. Man, I'm going to miss this show. Atreides, you summed up my feelings exactly. If we don't get another season, the cast and crew left the viewers satisfied and in a very good place. And if we do get blessed with another, there is plenty of potential. In case anybody is interested (and didn't already read it), AV Club did an interview with Timothy Omundson, the actor who plays King Richard. I desperately want this show to be renewed. Like... it's just straight-up delightful. I never would have expected it really considering I was a little 'meh' on the first season (not hugely 'meh', but mildly 'meh') but I love this one to death. "Men and women of the second season, ATTACK!" Everything about the second season was amazing. My only minor quibble is that there are now so many characters that the songs were spread a little thin - and I was surprised they had a guest star sing us out, even if it was Weird Al. Still, A++ will watch again (immediately, because at least one scene each episode had us howling too hard to hear the next bit). "Shall I write the king a theme song?" "Shut up, Menken!" I really enjoyed the second season two. It would be great if there could be another season, but if this is the end, they really went out on top. This was delightful, I was delighted. If there is no more, then at least this is an acceptable point for the story to end. Ok, so it's like. A full week later from this thread but I HAVE to revisit it because I rewatched the entire second season (again) and I love this show so much. And I rewatched the first as well and realized I hadn't really given it a fair shot the first go around, because really, it was pretty spectacular in its own right. But the second season allowed for so much more character growth on all sides, and I think more importantly a really good look at the whole 'true love' storyline thing, and a real-life fairytale ending vs. a straight-up fairytale ending in that, for example, Galavant and Isabelle are kicked out of their still-there-but-somewhat-fictionalized perfect love (man that kiss sucked huh), but they still love each other and the point is they put in the effort to make it work rather than writing it off as imperfect. There was so much character development! For so many of the characters! SO MUCH it was so good. This show went to some really interesting places and I probably care too much about a silly musical period/fantasy piece. ANYWAY MY POINT IS if this show hadn't gotten a surprise second season it would have been an absolute travesty and a huge waste (well... not waste. failure to utilize?) an incredible amount of talent from both the actors and the writers, and really the costume designers too because that definitely improved from season 1 (more money? probably even though ABC seemed reticent to take too much of a gamble on them). 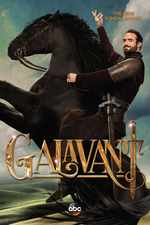 It's official; Galavant is cancelled. Tad Cooper will live on in our hearts. Finally finished watching this, was satisfied at the ending. In my head, they cut in some footage from Game of Thrones to show Tad Cooper all grown up. Game of what? Oh, is that the Galavant ripoff with a bunch of people who can't sing?